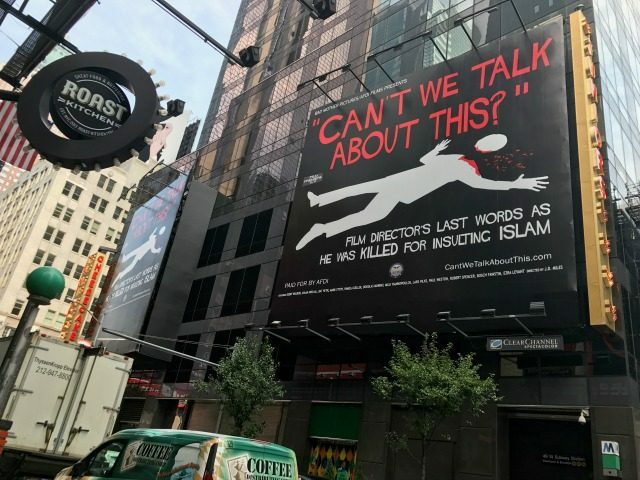 My organization, the American Freedom Defense Initiative (AFDI), has launched a massive ad campaign on one hundred New York City buses and two landmark billboards in New York’s Times Square calling attention to the Islamic war on free speech in the West. 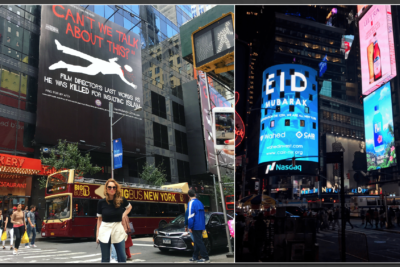 These groundbreaking ads come at the same time that the Council on American-Islamic Relations (CAIR) has spent hundreds of thousands of dollars promoting sharia at the same iconic location. 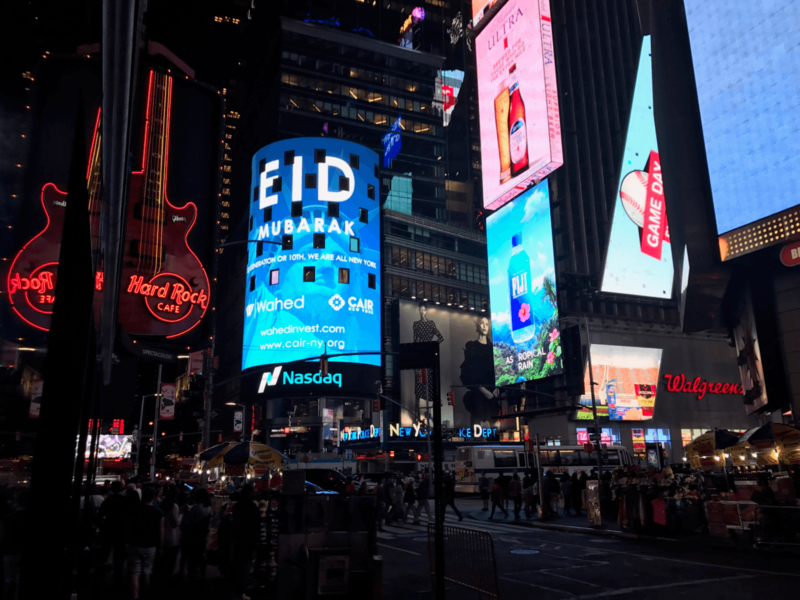 Sharia investment, the focus of CAIR’s partner, Wahed Invest LLC, prohibits investments in whole American sectors — tobacco, pork, alcohol and some forms of entertainment. Further, 2.5% must go to zakat (Islamic charity). But this time, CAIR’s message is being met with hard truths. 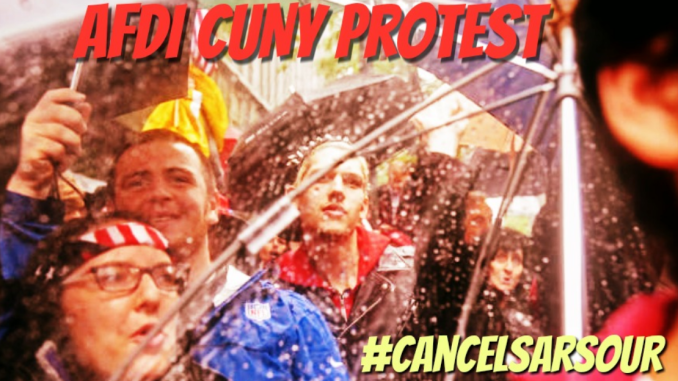 AFDI’s billboards will be running billboards in Times Square telling the truth at the same time CAIR’s lies run. 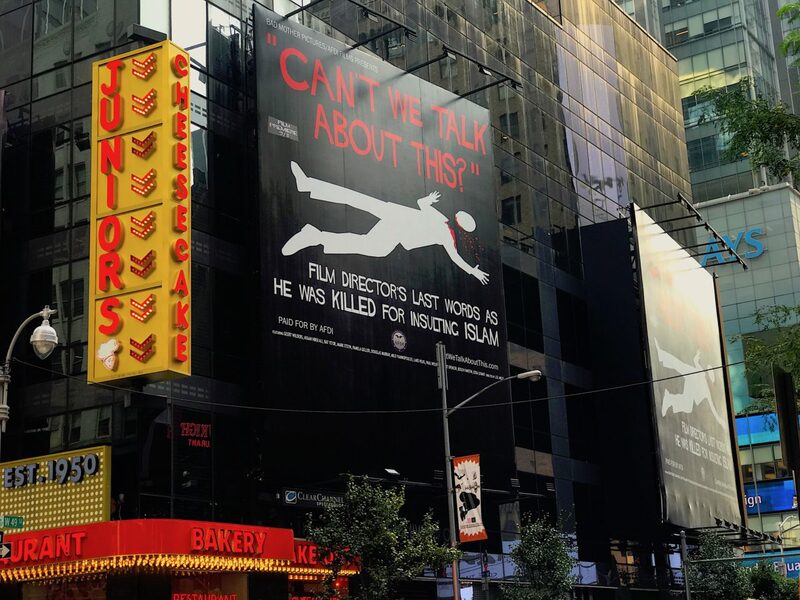 My billboard announces the imminent release of Can’t We Talk About This? 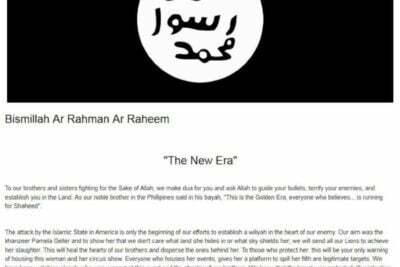 The Islamic Jihad Against Free Speech, a shocking new film and follow-up video series detailing the concerted effort by international organizations to compel the U.S. and other Western countries to curtail freedom of speech and criminalize criticism of Islam. Featuring exclusive new interviews with me, Ayaan Hirsi Ali, Geert Wilders, Mark Steyn, Douglas Murray, Ezra Levant, Lars Vilks, Garland Muhammad cartoon contest winner Bosch Fawstin, and many other heroes of freedom, this web series will be the first ever to expose the war on free speech. 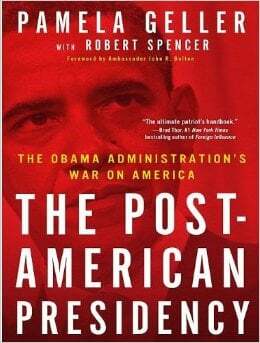 It is certain to shock the American public and awaken many. These interviews reveal events at Garland and its aftermath that have never before been made public and demonstrate how far advanced the war on free speech really is. In this film, we’re setting the record straight about our Garland free speech event, at which we were not only targeted by Islamic jihadis but apparently by the FBI as well. But we’re doing much more as well: we’re telling the whole, as-yet-untold truth about the war on free speech. Hollywood will never tell this story. The media will never tell this story. Our public schools and universities will never teach our children what happened. The truth must be told. Can’t We Talk About This? is a follow-up to AFDI’s acclaimed 2011 documentary, The Ground Zero Mosque: The Second Wave of the 9/11 Attacks. This much-needed new web series gives viewers the inside story of what happened in Garland and why and lays out the full and appalling details of the all-out assault on the freedom of speech that is taking place today – and why this may be the most crucial battleground today in the war for the survival of the United States of America as a free republic. The web series also features seldom-seen news footage and revealing details not only of the Garland event and the jihad killers who wanted to wage jihad there, but also of the many other battlegrounds in the war for free speech that led up to the Garland attack, including the death fatwa issued in 1989 by the Islamic Republic of Iran against Salman Rushdie for his supposed blasphemy in The Satanic Verses; the assassination of Theo Van Gogh by a Muslim on an Amsterdam street in November 2004 for his alleged blasphemy; the Dutch newspaper Jyllands Posten’s cartoons of Muhammad, published in September 2005, which touched off international riots and killings by Muslims – and most disturbing of all, calls in the West for restrictions on the freedom of speech; the Organization of Islamic Cooperation’s years-long struggle at the UN to compel the West to criminalize “incitement to religious hatred” (a euphemism for criticism of Islam); and the U.S. under Obama signing on to UNCHR Resolution 16/18, which calls on member states to work to restrict incitement to religious hatred. Can’t We Talk About This? also covers lesser-known skirmishes in the war against free speech as well, such as Seattle cartoonist Molly Norris’ “Everybody Draw Muhammad Day” in 2010, after which Norris was forced to go into hiding and change her identity after threats. 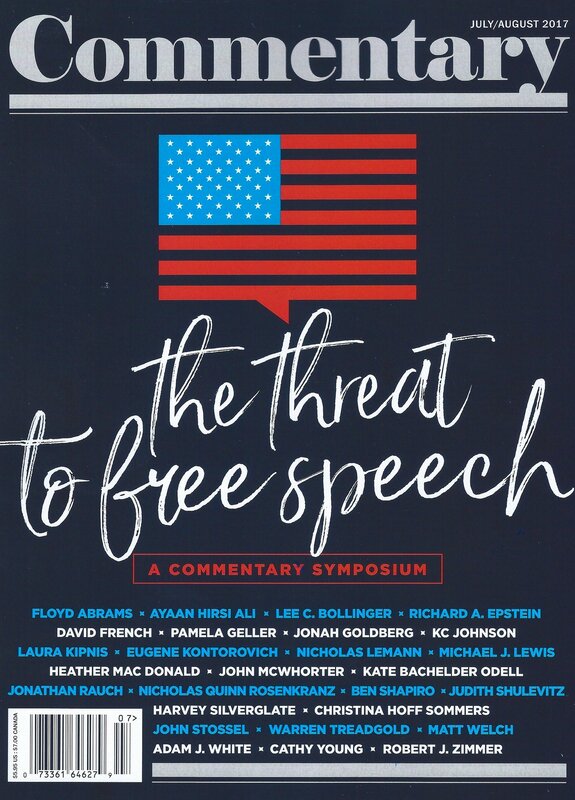 And it traces what immediately led up to the Garland event – most notably, the January 2015 massacre of Muhammad cartoonists at the offices of the Charlie Hebdo satirical magazine in Paris and the subsequent “Stand with the Prophet” event in Garland, at which Muslim groups gathered in the wake of that massacre not to defend free speech, but to complain about “Islamophobia” while AFDI members and supporters protested outside. We set out the media firestorm that followed the Garland event, as well as the attempts to kill me, and explain why the event’s detractors were all missing the point: freedom of speech doesn’t apply only if you like the message; it applies to everyone. And if it is gone, so is a free society. Can’t We Talk About This? tells the whole horrifying story of how advanced the Islamic war on free speech is, and how close leftist and Islamic authoritarians are to final victory and the death of the freedom of speech and free society. Don’t miss the exclusive advance screening of Can’t We Talk About This? on September 5 on VIMEO. And if you’re in New York City, look for our truth-telling billboard in Times Square. And please help us meet the massive expenses of our truth campaigns: contribute here. 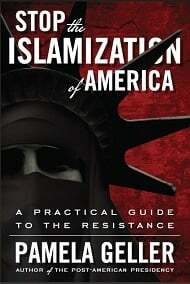 Pamela Geller is the President of the American Freedom Defense Initiative (AFDI), publisher of PamelaGeller.com and author of The Post-American Presidency: The Obama Administration’s War on America and Stop the Islamization of America: A Practical Guide to the Resistance. Follow her on Twitter here. Like her on Facebook here and follow here on Twitter here.